Tommaso di Carpegna Falconieri and Riccardo Facchini, eds. 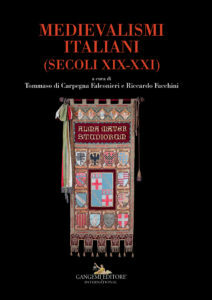 Medievalismi italiani (secoli XIX–XXI). Rome: Gangemi, 2018. This is a glossy volume with a number of black-and-white illustrations that brings together nine essays on a variety of topics related to modern Italian medievalism. The focus here is on medievalism in a socio-political sphere. Consequently, rather than essays either on literary topics or on multi-media medievalism (ever popular subjects within the field), the contributors turn their attention—and the reader’s—to what we might term civic medievalism in the relatively recent past. Emblematic in this regard is Davide Iacono’s essay on the construction of Mussolini as a noble and heroic condottiero, with a corresponding investigation of the fascist fascination of and investment in medievalist thinking (pp. 53–66). This volume thus brings to light an often ugly side of medievalism: namely, the uses or misuses of medievalism for dubious political ends. Nonetheless, the juxtaposition of essays also demonstrates overall the very different uses and very wide appeal of medievalist tropes and imagery across the Italian political spectrum over time. In this regard the proposed plural of the title—medievalismi—is very apt. One of the editors proposes two guiding threads within this plurality to aid the reader: cities and Catholicism (p. 20). These are not only the two poles around which the collected essays gravitate, but they are also argued to be more generally key distinctive sites of Italian medievalism. A further suggested feature, unique to this tradition, is the position of the Middle Ages in Italy as typically overshadowed by both the Classical era and the bright lights of the Renaissance. This perspective perhaps helps to explain the relative neglect of medievalism as a scholarly area of study in Italy, especially compared to other countries such as the USA, the UK, or France. Equally, however, Italian medievalism also often overlooks any strict divide between the Middle Ages and the Renaissance, with many purportedly medievalist myths (for instance, the aforementioned ideal of the condottiero) drawing on aspects of both periods. Following these two threads, on the cities side Francesco Pirani treats the development of maritime republics both as a concept and as a progressively fixed four-part canon (namely, Amalfi, Pisa, Genoa, and Venice), with an emphasis on shifting perceptions from the Risorgimento to fascism and beyond (pp. 131–48). The irony that these republics are perceived as such only once they have lost this distinct status does not go unremarked (cf. p. 144). Meanwhile, Francesca Roversi Monaco studies anniversary celebrations of the University of Bologna masterminded by Giosuè Carducci in 1888 and revived in 1988 (pp. 149–62). In this essay, particular attention is paid to the specific context of each commemoration, the first being played out against a backdrop of a newly unified Italy and the latter, instead, taking place on a more European stage. The question of the ethnic identity of the Longobards (so-called ‘barbari’ [barbarians]), discussed by Stella Losasso, belongs also to this civic thread, relying as it does on archaeological evidence of past settlements and their burial sites (pp. 75–92). Losasso’s conclusion that the Middle Ages are characterized by ‘una cultura “creola”’ [a ‘creole’ culture] is welcome for its embracing of multiculturalism (p. 92), especially since her essay begins with a reminder that ‘il racconto e la percezione del passato dipendano dalla temperie culturale in cui sono prodotti’ [the narration and the perception of the past rely upon the cultural climate in which they are produced] (p. 75). The question of religion, in contrast, is most important to the work of Riccardo Facchini and Sonia Merli respectively. Facchini considers the medievalist tendencies of traditionalists in the wake of the Second Vatican Council; for these, the Middle Ages represented an ideal age of Catholic power and omnipresence (pp. 29–51). He also assesses the adoption of the crusades as a lens through which to view contemporary conflicts, noting that prior to the Islamophobia of the early twenty-first century, the model of the crusades was used rather either as an anti-Communist weapon or more broadly as an argument in favour of greater Catholic militancy. Merli instead investigates the myths of templars and templarism up until quite recently, both within the Catholic Church and in relation to tourism and popular medievalism more broadly (pp. 93–114). She thus connects religious ritual to specific urban sites, including the marketing of Caggiano, for instance, as a templar town, ‘“città dei templari”’ (pp. 108–9). It is, however, Geraldine Leardi’s short contribution on the Hagia Sophia that weaves the two guiding threads most closely together, in an essay that adds orientalism to the medievalist mix by considering the representation of this building in the work of specific late nineteenth-century Italian visitors (in particular, the writer Edmondo De Amicis and the painter Cesare Biseo: pp. 67–74). Chapters two to nine (that is, from Facchini to Roversi Monaco; in fact the chapters are unnumbered, and incidentally do seem to be rather oddly ordered alphabetically by name of contributor) offer meticulously researched case studies of different moments of medieval inspiration in modern Italian history. Collectively, they act as a persuasive reminder of the necessarily interdisciplinary nature of the study of medievalism, drawing on a diverse range of subjects: history, politics, religion, archaeology, and architecture (this list is not exhaustive, but represents the principal areas to be found in this volume). The volume is additionally notable for the space it devotes not only to the work of female academics, but also for its attentiveness to women’s history, thanks in particular to Maria Chiara Pepa’s study of the adoption of the medieval guerriera Marzia Ubaldini as a role model for and by female Risorgimento activists (pp. 115–130). Beyond their status as illustrative examples of broader patterns of medievalism, these chapters will individually be useful to historians of various movements and myths, and each doubtless represents the tip of the iceberg of larger research topics for each contributor. From this perspective, the volume acts as a tantalizing taster of current foci within the burgeoning field of Italian medievalism, although it is inevitably not comprehensive. More general in appeal and international in scope is the opening essay (chapter one in my numbering) by Tommaso di Carpegna Falconieri on ‘Medievalismi: il posto dell’Italia’ [Medievalisms: The Place of Italy] (pp. 9–28). In this essay, Carpegna Falconieri is explicitly in dialogue with recent Anglo-American scholarship within the field of medievalism, especially works by Richard Utz and David Matthews. Within this context, some of his claims—for instance, the argument that medievalism and medieval studies must be understood to be porous, interconnected, and dehierarchized—are, accordingly, not necessarily surprising to an Anglophone readership, although they are very passionately and elegantly put. More provocative and unsettling is Carpegna Falconieri’s fair criticism of the field of medievalism as too often monolingually Anglophone, with a concomitant neglect of Italian sources and studies, especially those written in Italian and not available in translation (see p. 15 for an excoriating critique of the current ‘imperialismo culturale anglosassone’ [Anglosaxon cultural imperialism] within academia). This neglect is, of course, not helped by the status of Italian medievalism within Italy as a not yet well-recognized or well-defined field of study. Nonetheless, this same neglect may in itself be an opportunity, presenting untilled land with rich fruits still be harvested. The conditions are not themselves promising; Carpegna Falconieri rehearses familiar though crucial arguments about the underfunding of universities, the decline of the humanities, and a disconnect between academia and the general public, all problems that may be acute in but are certainly not unique to Italy. Notwithstanding, he does identify some already established sites of medievalism within the Italian academic landscape (in particular, Bari, Turin, and Bologna), and the location of the contributors themselves suggest a few more (especially Urbino). The overall sense is, then, that this volume promises a rich future for the study of medievalism in Italy, whilst also reminding us of the need to encourage greater internationalism in this sphere.